Adding rookie Svi Mykhailiuk gives the Pistons four wings on rookie contracts for next season and a better chance to fill their other roster needs. AUBURN HILLS – Would the Pistons have pulled the trigger on the trade of Reggie Bullock if instead of being 24-29 at the moment of Thursday’s trade deadline they were 29-24? Instead of clawing for the eighth playoff spot, as they are, they’d be clawing for home-court advantage in the first round. So would they have still gone ahead and traded their best 3-point shooter when they were virtually assured a playoff spot and headed for a first-round matchup that Las Vegas oddsmakers wouldn’t consider a mismatch? Dealing Bullock for a rookie – even a rookie who has a chance to grow into the type of 3-point weapon Bullock eventually became – and a future No. 2 pick doesn’t mean the Pistons are punting this season, but there’s no way to argue it makes them more likely to mount a playoff charge over the season’s final 29 games. Bullock was averaging 12.1 points for a team that’s struggled to generate consistent offense and shooting 39 percent from the 3-point arc for a team that’s been mired in last place in 3-point shooting for much of the season. But injuries and missed opportunities to stack wins together boxed in the Pistons. Their schedule the rest of the season is more forgiving, though they’ll play 16 of their final 29 on the road. It’s still going to be tough enough to scratch out a playoff spot, let alone a more favorable berth than the No. 7 or 8 seed that would lengthen their odds of a first-round upset. So to understand the deal, you first must appreciate the dark corner Ed Stefanski and his front office inherited. The Pistons are over the salary cap – not only this season, but next as it stands now – and only have three players on rookie contracts as part of their rotation: Stanley Johnson, Luke Kennard and rookie Bruce Brown. Johnson’s rookie contract falls off at season’s end, making him a restricted free agent. Retaining Bullock in free agency was going to be tough to impossible in July, especially if the market for him gets to eight figures – not at all a stretch given the quest for 3-and-D wings who can shoot at elite levels, as Bullock did last season. So the Pistons cashed him in for a prospect the front office liked in Svi Mykhailiuk, a player who – at 6-foot-8 and 21 years old – could mature into exactly the type of player Bullock became since coming from Phoenix 3½ years ago. Mykhailiuk arrived at Kansas highly acclaimed but only 17 years old from Ukraine and grew into an elite college shooter. Over 136 college games, he hit 41 percent from the 3-point line and 44 percent as a senior. Mykhailiuk went nine spots after Khyri Thomas last June, five spots after Brown. It’s early, but it looks like the Pistons got two keepers from Stefanski’s first draft. It’s fair to guess they had Mykhailiuk ranked similarly, based on this trade, and you can bet the Pistons are eager to spend an off-season honing his skills. Mykhailiuk opened eyes at Summer League last July, flashing many of the skills that make Kennard more than just a spot-up shooter. By next season, the Pistons could have four players on rookie contracts eating up many of the 96 minutes available at the two wing spots: Kennard, Brown, Thomas and Mykhailuk. They’ll have the mid-level exception at their disposal and a first-round draft pick with their biggest need likely coming at point guard. Reggie Jackson has appeared to turn the corner over the past few weeks, averaging 19.0 points, 6.3 assists and less than a turnover per game while shooting .475 overall and .408 from the 3-point arc over seven games. Getting a full season of that guy transforms the Pistons from a bottom-10 offense to at least league average and potentially top 10. They’ll still need a backup point guard – Ish Smith is a pending free agent – and Dwane Casey’s fondness for multiple ballhandlers likely will prioritize point guard even with Jackson at full stride. So Stefanski needed to find cost-effective options for his depth chart on the wings. He saw this day coming last June when he traded two future second-rounders for Thomas and nabbed Brown, too. Adding Mykhailiuk further restocks the wings, giving the Pistons three players under control for at least two more seasons. Don’t discount the value of the second-round pick included in the deal, either – or the $2.5 million trade exception the Pistons acquired. The Pistons have their second-rounder in 2019 but had relinquished second-rounders in 2020, ’21 and ’22. Having the 2021 pick in their back pocket could come in handy at the 2020 or ’21 trade deadline when their cap sheet will have been smoothed out and the Pistons are back in play as potential buyers to augment a playoff drive. As for the trade exception, the Pistons have a year to use it – and as they push themselves farther under the tax line, the more likely it becomes that they put it to use. In the meantime, dealing Bullock opens 30 minutes a game for Kennard, Thomas, Brown, Langston Galloway, Glenn Robinson III – and Mykhailiuk – to fight over. 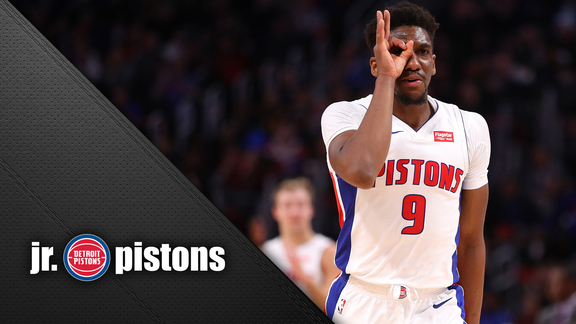 Jackson’s recent uptick makes him the complementary scorer to play off of Griffin the Pistons needed, easing the absence of Bullock’s scoring, and lessens the burden on those who’ll replace him. A playoff spot wasn’t assured by hanging on to Bullock and isn’t ruled out by dealing him. The biggest impact of trading him will be felt next season, the possibilities for which were enhanced by this trade.